The PortaPockets Purse Insert – The bestselling pattern that almost wasn’t! Guest writing for us today is Kathy Southern, aka Kat, of StudioKat Designs. If you haven’t tried her purse patterns yet, you don’t know what you’re missing! “People often ask me where I get my inspiration for the handbag patterns I design, and the truth is, I have been on a quest for the perfect handbag since I was a young girl. Having spent the greater portion of my life seeking this perfect purse, and not finding it, I finally decided to just try to design it myself! I love the ease and style of a smaller bag, but let’s face it, I need to carry a lot of “stuff”, and a small bag doesn’t always get the job done. My early efforts, such as the Vervalise, Bellagio, AbracaNiche and especially the Gadabout and Odyssey, involved designing multitudes of organizational features into relatively small bags to increase their functionality. I loved the fact that these bags had the fashion sense & easy usage of small bags, yet offered storage capabilities that belied their smaller size. While pleased with these early successes, I was still aggravated at the time it took to switch bags, and to adjust to each bag’s interior features, especially when I wanted to carry one of my beautiful leather bags for an occasion! I found I often had to sacrifice the convenience of carrying certain items because of purse dimensions, or worse, resort to also carry a tote bag at times, in order to have the additional items on hand when I needed them. My “ah-ha” moment came when I decided to address this problem by playing around a bit with the idea of designing a removable purse interior that could be switched from bag to bag. My first prototype was very basic and my initial plan was to market this new design as a free incentive pattern. But the more I used my new accessory, the more features I added and soon the pattern was far too complex for a give-a-way. Still, I wasn’t convinced that your average woman would be willing to actually buy a pattern for an item that basically no one would ever see but her.Enter my best friend, the perfect product tester (picture the infamous Samsonite gorilla). Mary carried a prototype for a few weeks, now named the “PortaPockets Purse Insert, and a few days later, called with effusive praise! Not only did she enjoy using the Insert, she enjoyed it so much that she refused to give it back! Declaring it to eventually be my best-seller, she encouraged me in the strongest possible terms, to proceed full-steam ahead. Given Mary’s stellar review, I continued developing the PortaPockets Purse Insert, eventually offering it in two convenient sizes in the same pattern envelope, and to use a cliché… the rest is history. 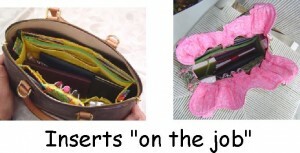 Women from all walks of life appreciate the organization that a PortaPockets Insert it brings to their handbags. No more digging for keys or struggling to find your cellphone before it stops ringing. No more carrying both a diaper bag or a brief case, AND a purse. Simply lift your PortaPockets from your purse and drop it into the larger bag. You’ll lighten your load and free up your hands, without sacrificing any of your daily items. The response to the PortaPockets Purse Insert has been so overwhelmingly positive, that almost immediately, customers began clamoring for me to design handbags that they could use with their new favorite accessory item. 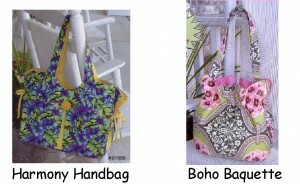 For this reason, we have added the Harmony Handbag and the Boho Baguette to our handbag pattern line. Not only are they beautiful handbags in their own right, but they have both been designed to work in perfect collaboration with our now best-selling PortaPockets Purse Insert.